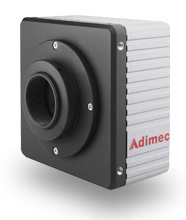 The Adimec A-4×50 series are unique 4 Megapixel CMOS rolling shutter cameras with the superior image quality of comparable CCD cameras through Adimec’s proprietary electronic design. Up to 196 frames per second can be achieved with the smallest form factor and extremely low power consumption. The A-4×50-series was created for equipment manufacturers worldwide whose demanding machine vision applications require a camera that will make a difference in their high-end inspection systems.